This week's update to Old School sees the release of the Teleport to Target spell as well as a tip-tastic emote for the fedora. 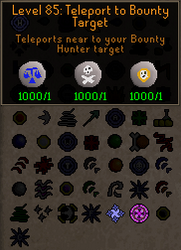 A scroll that permanently unlocks the Teleport to Target spell is now available from the Bounty Hunter rewards shop. When read, the scroll unlocks the spell on all spellbooks. Teleport to Target requires level 85 magic, 1 death rune, 1 chaos rune and 1 law rune to cast. Both you and your target must be in the wilderness in order to cast the spell. It will teleport you within 12 squares of your target. The spell cannot be used in combat. The Teleport to Target scroll is tradeable, you do not need to have 8,000,000 bounties in order to unlock the spell if you have the coins to buy it from another player. Before Mod Alfred went on his way to university he created a 'Tip' emote for the fedora. Poll #26 asked the community whether it should enter the game and it passed with flying colours. When wearing a fedora you will now be able to right click it and select 'Tip' to perform the emote shown below. The Well of Goodwill can now be found slightly east of Varrock west bank. The well will not be usable until Saturday 1st November at 0:01 GMT so you will have to wait a little longer before offering your donations to the available charities. You will hear more about the specifics of the Well of Goodwill tomorrow. Until then, enjoy the lovely-looking well. -Some shops now have separate stocks for Iron man and standard accounts. -The examine info of the Armadyl chainskirt now refers to a chainskirt, not plateskirt. -Fixed a typo on the Scythe Sharpener in the Halloween event. -You can now light fires in the Castlewars lobby again. -The skillcape emote button now lights up for quest cape holders. -Removed an incorrect use of capitalization on the examine info of the amulet of magic. -God dragonhide armour is now listed in the Ranged skill guide. -The Lunar spell Humidify will now work on saplings held in your inventory. -The Sinister chest will now give herbs in noted form. -Bankpin sounds have been reverted to their original audio. When is the Halloween Event getting removed? normally 1 week after Halloween? Ultimate ironmen need bank pins for their inventory! What was wrong with the bank pin audio?